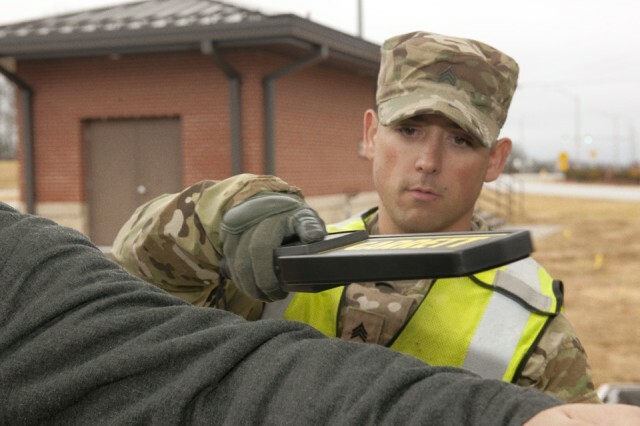 Fifty Missouri National Guard Soldiers braved the weather over the long weekend to train with the Fort Leonard Wood Directorate of Emergency Services Physical Security section in preparation for an upcoming deployment. Led by Staff Sgt. 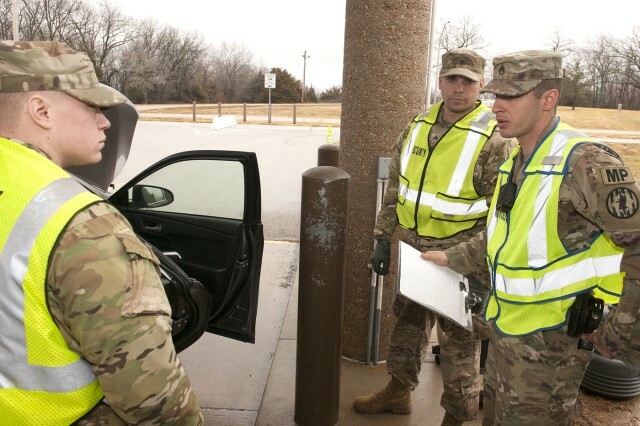 Andrew Averett, Physical Security noncommissioned officer in charge, the training was designed to prepare the National Guard Soldiers from 1st Battalion, 138th Infantry Regiment in access and entry control point procedures. Missouri National Guard Sgt. Chris Crowson said the training is exactly what they needed because this will be their primary mission while on deployment. Their training included unarmed-self defense, the rules of engagement, anti-terrorism measures, interpersonal communication and vehicle inspections. The three-day course, Averett and his team provided was tailored so Soldiers in attendance can return to their unit and become trainers for the rest of those going on the deployment. "Our command decided it would be good for the leadership to work the (entry and access control procedures) so we can go back and train our Soldiers," Crowson said. "It was really good training that we will be able to take back to our units and apply it to meet our standards over there." The final day of training was spent at North Gate, where Soldiers assisted in identification checks, and private and commercial vehicle inspections. Sgt. Jacob Schoendienst, Company B, 1st Bn., 138th Inf. Reg., and Crowsen both said the opportunity to put the training into action was the most beneficial because it provided an actual human interaction aspect to the training. "It made it more realistic," Schoendienst said. "They got a real-world experience while they were here," Averett added. Averett said having the opportunity to train Soldiers preparing for deployment was good not only for Fort Leonard Wood, but also for himself. "I want to thank their unit for giving us an opportunity like this," he said. "These people are putting their lives in harms way for us. I wanted to do this for them because it meant something to me, and I know it meant something to them," Averett said.